Posted by Michael La Prairie on Friday, August 31st, 2018 at 7:03am. Of the 1,965 market housing units, 84% will be 2 or 3 bedrooms. Of the 580 rental and social units, 249 (43%) will be 2 or 3 bedrooms. It’s a good example of transit-oriented, mixed retail, residential and commercial development, including 9 acres of park space, and a reminder of something similar underway at Richmond’s venerable Lansdowne Centre Mall. Oakridge, like Lansdowne, is yet another role model for the much bigger but still mysterious Jericho development (90+ acres), which has land, a terrific location, but no rapid transit yet. See previous Price Tags coverage HERE, HERE, and project data HERE. And more renderings HERE (with thanks to Peter Meiszner at UrbanYVR). From Development Permit Project Data PDF (link above). Working with QuadReal and developer Westbank, Henriquez Partners is acting as the Project Master Plan and Residential Design lead, working with Interior Designers WonderWall, Retail Architect Gensler, and Executive Architects Adamson Associates. The redeveloped Oakridge Centre includes varied residential housing that will cater to families and seniors. The development includes 290 rental units, 290 affordable housing units plus traditional market housing options. Residential use amounts to nearly 2.76 million square feet, 20% of which will be affordable units. Alongside residential use, the new development will also include retail (double the current size), office space, and 100,000 square feet of civic amenities including a library, a community centre and a daycare. A 9-acre community park is also part of the vision, plus a network of pedestrian pathways across the development (over 5 acres) that will link these components—promoting walkability while creating opportunities for meaningful community interaction. The Oakridge Centre development aims to set new precedents for social, cultural, economic, and environmental sustainability. Building on the success of the adjacent Canada Line SkyTrain, Oakridge will explore alternative transportation solutions such as car co-ops, bike and car valets, bike and car shares, and reduced parking ratios. Parking is always an interesting topic, since it uses up a whole lot of space, and is an enabler of behaviour. The shiny new Oakridge will have 4,783 personal motor vehicle spaces, with 1,550 for the 2,548 residential units (0.6 per unit) and 2,381 for retail customers and presumably, employees. Offices & civic centre — 852. Bicycles? Glad you asked: 3,185 spaces for residential bike parking (1.25 per unit). Clearly, the new Oakridge is anticipating walking, cycling, transit and car-sharing for it’s population of residents, shoppers and workers. Multi-modal people in a multi-modal city, in other words, with many choices of ways and means when it comes to travel. The new development replaces a squat, ancient, car-oriented shopping mall that dates from around 1956. Old Oakridge is mostly one-story with a parking lot on top, surrounded by a giant parking lot, two small towers, and at least two levels of parking beneath. Ya know, cars, cars, cars. They’re what space is for. And they’re the one and only travel mode. 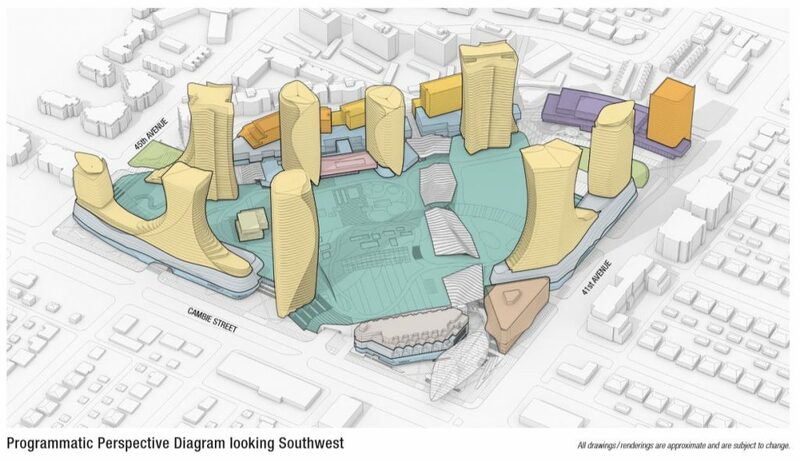 Meanwhile, this sort of 6-decade-old thinking, being repudiated via teardowns and redevelopments, seems to have fled to the land that time forgot, where has risen that dusty old clone-of-ye-olde-Oakridge, Tsawassen Mills. It’s a sprawling mall in a sea of asphalt (6,000 parking places), and it has earned LEED Core Shell status, leaving me baffled as to how that is possible, unless of course your vision is narrowed, blinkered and myopic to a truly remarkable extent.